At GDC’09 the new gaming evniroment OnLive was announced. 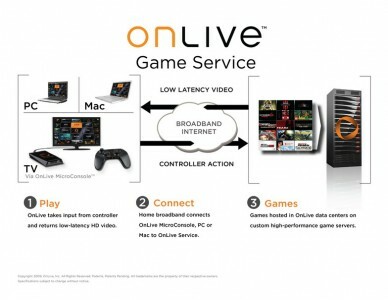 The concept is that you the game to the OnLive hardware or PC/Mac. Well, it’s actually only the picture/video is streamed, since all the calculations and the real gaminghardware is somewhere else. If you have a broadband connection you get the games in 720p, and if your internet connection is slow, you get SD picture quality. Just like Netflix, but on-demand gaming, micro-console. For a good walkthrough of everything, take a look at Gamespot.com, they have it well covered. You can also watch the OnLive announcement/keynote on Gamespot.com. Steve Ballmer, Microsoft CEO, and Robbie Bach, president of the Entertainment and Devices Division, unveil developments and partnerships involving Windows, Windows Live, Xbox, and other offerings. Las Vegas, Jan. 7, 2009. Here is the video of the full keynote, taken from G4TV.com.